In the absence of microfluidic rigs, most live imaging protocols utilize flat agarose pads along with anesthetics and/or microbeads. It is often difficult to manipulate the worms position in this set up and thus a higher number of worms need to be mounted to ensure a few showing an optimal position for imaging. This is problematic when trying to image nematodes with genotypes that are scarce within a strain, such as m+z- sterile or embryonic/larval lethal, because finding enough animals to mount can be challenging. In order to image worms of genotypes that are hard to find, we slightly modified a previously published protocol (Zhang, M. et al., 2008) to make agarose pads that allow us to maintain L4 or adult hermaphrodites and adult males straight during imaging for at least 2 hours. These pads also appear to reduce rolling of the worms during imaging. A 12-inch long-playing (LP) vinyl record, labeling tape, Pasteur pipette with bulb, agar (at the concentration in which you prefer to use, we use 4% agar), microscope slides, your preferred anesthetic (we use either levamisole or serotonin), a minutien pin (eyelash pick), coverslips, a petroleum jelly (we use Vaseline) filled syringe with a flat end needle. 1. Place strips of tape 1.5-2 inches apart perpendicular to the grooves on the vinyl record’s grooved surface, as shown in Figure 1.A. 2. Pipette a drop of melted agarose onto the vinyl record between the strips of tape, and immediately add a microscope slide on top of the drop to make a pad against the vinyl record. 3. 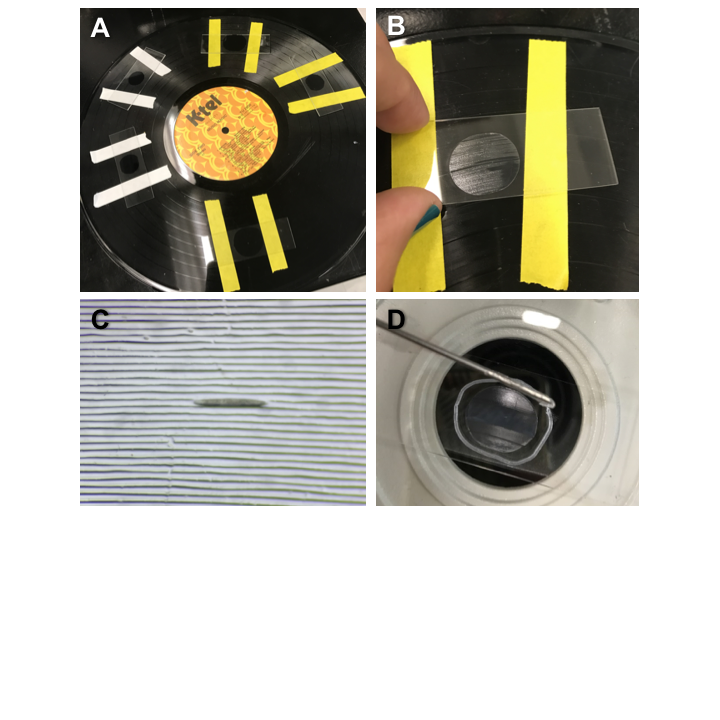 After cooling, remove microscope slide from the vinyl record by lifting from one side as shown in Figure 1.B. If the pad is too large, it can be trimmed down by using another microscope slide’s flat edge to make straight cuts. 4. Add a volume of 2-5l of anesthetic at a time, depending on the size of your pad. Then pick worms onto anesthetic droplet (the grooves are an optimal width for hermaphrodites from L4-adult). 5. Position worms into the grooves in the agarose pad utilizing the minutien pin (Figure 1.C). Worms are easier to position when most of the anesthetic has been absorbed into the pad, but don’t allow it to dry completely, as this will form air bubbles in the adjacent grooves. 6. Make a circle line around the pad with the syringe filled with Vaseline before placing the coverslip as shown in Figure 1D. Slightly press the coverslip over the pad and vaseline to keep the worms in place and make a seal around the pad to prevent evaporation of the anesthetics mix. This protocol can be used in conjunction with microbeads, but in our hands they do not seem to improve the immobilization of the worms. The vinyl record grooved pads function, in part, as a poor-person’s microfluidics for live imaging. It allows the placing of worms into single channels organized as in a microfluidic chip, thus reducing the time searching for the worms for imaging on the slide. Addition of drugs or food (for prolonged imaging) could potentially be done with a fine needle inserted through the Vaseline ring. An additional advantage of these pads is that there is no difference in fluorescence brightness loss compared to the conventional agarose pad. This protocol’s affordability, the ease of use and training has simplified our live imaging of m+z- males expressing low fluorescence fusion proteins in the germline significantly. We thank the Mikaela Murph and Erlyana Clarke for trying the protocol and providing us with feedback. Figure 1: Figure 1: Overview of the process for making agar pads using a vinyl record surface. A. Laboratory label tape placed on vinyl disc gives reference where to place the agar drop and also establishes an even pad thickness. B. A drop of hot agar is covered with the microscope slide. Once agar has cooled down slide is lifted with the attached agar pad. C. Anesthetized C. elegans nematode aligned on a groove made with vinyl record. D. Vaseline perimeter is applied around the agar pad and slide cover is pressed slightly to seal in the humidity to prevent the nematodes from drying over long periods of imaging. Zhang, M., Chung, S. H., Fang-Yen, C., Craig, C., Kerr, R. A., Suzuki, H., … Schafer, W. R. (2008). A self-regulating feed-forward circuit controlling C. elegans egg-laying behavior. Current Biology : CB, 18(19), 1445–1455.